I keep spinning this around and around in my head. When did the word “natural” become so difficult to understand? Look it up in the Webster’s and you’ll find a lengthy description. How can such a little adjective strike so much controversy? Do we really need the Supreme Court or the FDA to provide this definition to us? Shouldn’t the companies embroiled in the numerous lawsuits for misleading and false advertising just man up on these party fouls?! Let’s take a closer look at the most potent parts of this word’s definition: “8a: occurring in conformity with the ordinary course of nature: not marvelous or supernatural.” Dear Naked Juice, aka PEPSICO, I disagree with your use of “natural” to include Fibersol®-2, Niacinamide, Cyanocobalamin, and Calcium pantothenate in your fruit smoothie drinks. (Read the lawsuit details here.) The fact to keep in mind here, is that these chemicals are already federally recognized as synthetic substances! 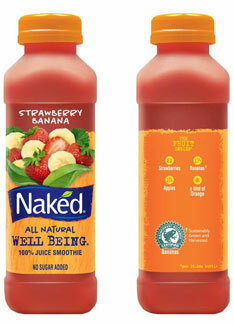 This may be naked, but it’s certainly not honest! This just goes to prove that we can no longer remain idle and trusting that food producers will do what’s right and honest. Even certified organic foods are not without peril. One of the most trusted brands of organic baby food and rice cereal, Earth’s Best Organic is currently under the gun for including Martek Bioscience’s GMOs: Life’s DHA and Life’s ARA. I used to feed their Happy Bellies to my son! I’m more than a little outraged over this and believe they should immediately lose their organic status on offending products! The list of offenders goes on and on. If you’re really curious, then take a look at this article provided by the American Bar Association. When will this madness stop? When did we lose the right to know what we’re feeding our children?! I will end my rant by returning to the first part of natural’s definition, “1 based on an inherent sense of right and wrong <natural justice>.” Perhaps this the core issue of this matter. False advertising is misleading and malicious to, We the People. These companies should be required to correct the erroneous statements and suffer the consequences of their wrongs. Perhaps, the trick for Big Food is in the addition of the extra word “all” to their phraseology. 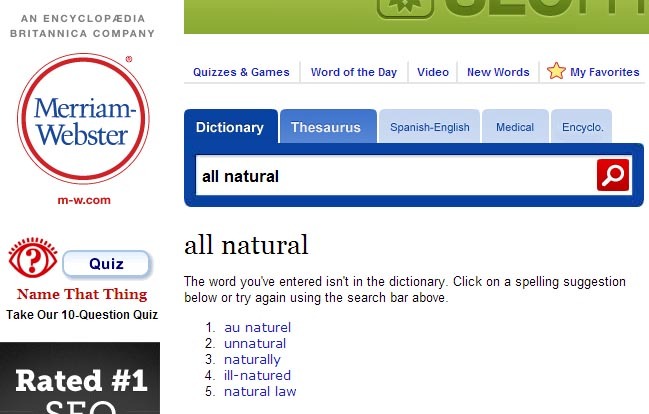 Sadly there is no definition available for “all natural” and it may very well take the Supreme Court to explain the implicit meaning of this word to the corporate giants.